Sometimes the choice of which flowering plants to grow in memory of someone is crystal clear. If, for example, a father prized his peonies (Paeonia spp.) 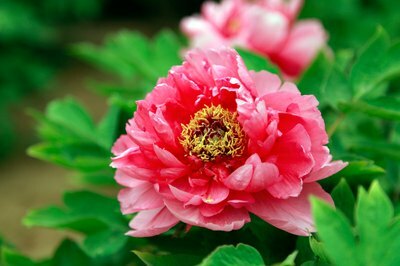 above all other plants, then peonies could be planted in his memory. Not everyone, however, has a favorite flower, but writers have associated plants with specific human characteristics for centuries. Whether in the language of flowers or your own words, plant a memorial with special meaning to you. Peonies are hardy in U.S. Department of Agriculture plant hardiness zones 3 through 8. Color is highly evocative, and many people display or express a strong association with a color. Keep strong the memory of someone who always had a touch of pink in her home decor or wardrobe by planting a pink-flowering azalea (Rhododendron spp., USDA zones 4 through 9, depending on the variety) or a pink-blooming rose (Rosa spp., USDA zones 4 through 10b, depending on the variety). Surround your pink centerpiece with the soft greens and dusky blues of lavender (Lavendula spp., USDA zones 5 through 8) for an old-fashioned look and for its aroma. Glossy-leaved annual salvias (Salvia spp.) that flower in shades of cream, salmon and burgundy give pink azaleas the subtlety of a monotone background and extend the color display. Perhaps your loved one waited impatiently for early signs of spring or liked the colorful quiet of fall. Steal a march on spring with Lenten rose or hellebore (Helleborus orientalis, USDA zones 4 through 8), which sprouts and even blooms in late-winter snow. Plant winter aconite (Eranthis hyemalis; USDA zones 4 through 7) in a sunny spot for a similar snow-defying bloom. 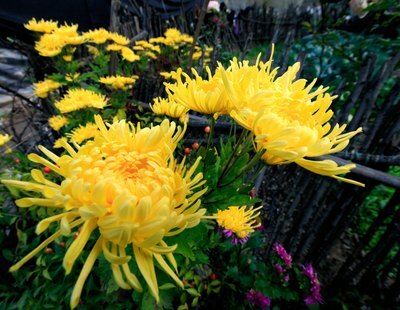 Hardy garden mums (Chrysanthemum spp., USDA zones 3 through 9) planted in spring provide an extended floral display through September, October and, in some climates, November. 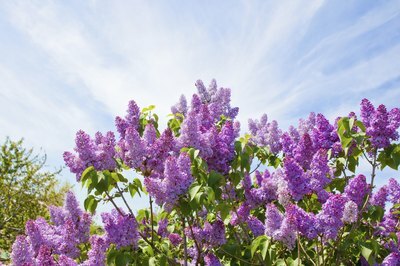 Gardeners have long treasured the regularity with which lilacs (Syringa spp., USDA zones 3 through 7) bloom at or close to Mother's Day. Not all plants are so obliging, but you can take actions to honor the memory of a special occasion with a loved one by planting a species that blooms during the time of year that special occasion took place. You even may be able to grow the person's favorite bulb plants in your climate zone just by changing the date when you plant the bulbs. Choosing plants with long blooming seasons maximizes your memorial. 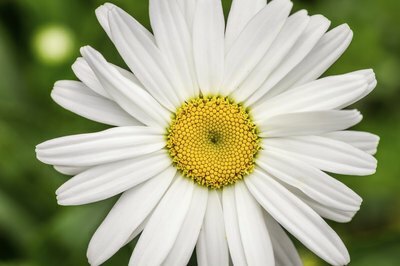 Although a daisy-loving person may have had her own favorite, shasta daisy (Leucanthemum x superbum, USDA zones 5 through 8) blooms from summer through early fall when its faded blooms are removed regularly. Also blooming during that time period or longer, black-eyed Susan (Rudbeckia hirta) offers even more flowers and requires less care than shasta daisy; black-eyed Susan grows in USDA zones 2 through 11 as an annual, biennial or perennial, depending on its variety. 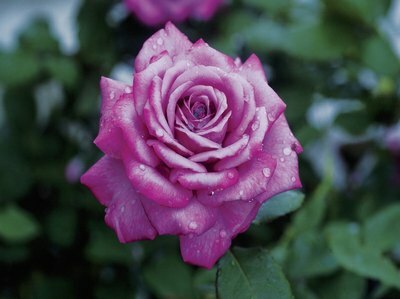 Many roses bloom heavily for several weeks during summer and rebloom in late summer, or they bloom sporadically throughout the growing season. 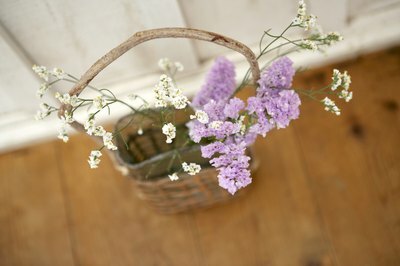 Lavender sometimes follows the same bloom pattern, creating visual interest throughout summer. Strengthen your remembrance by choosing flowering plants known for having long lives. Numerous rose varieties may last as long as 50 years, and peony plants may live 100 years. Although plants' actual lifespans may vary in your garden, large floral genera tend to contain cultivars that adapt to a wide range of growing conditions. For example, more than 200 magnolia species (Magnolia spp.) are in USDA zones 4 through 12, with some species hardy in only the cool part of that range and others hardy in only the warm portion. Choosing a large genus with a reputation for long-lived plants gives you the best chance of creating a lasting plant memorial that grows well in your garden.